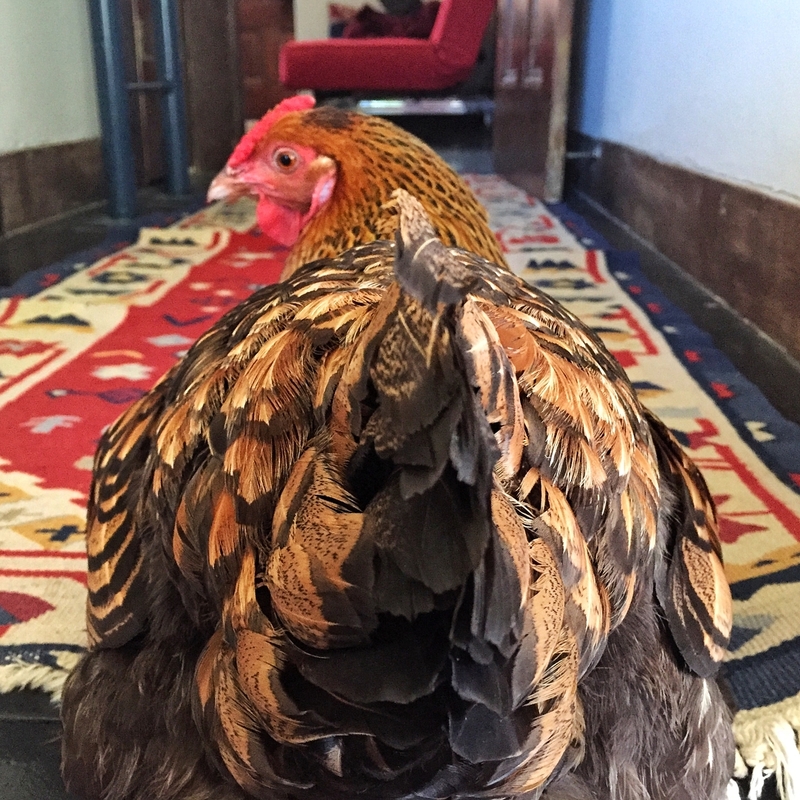 Miss Adzuki is a two-year old Golden Laced Wyandotte. 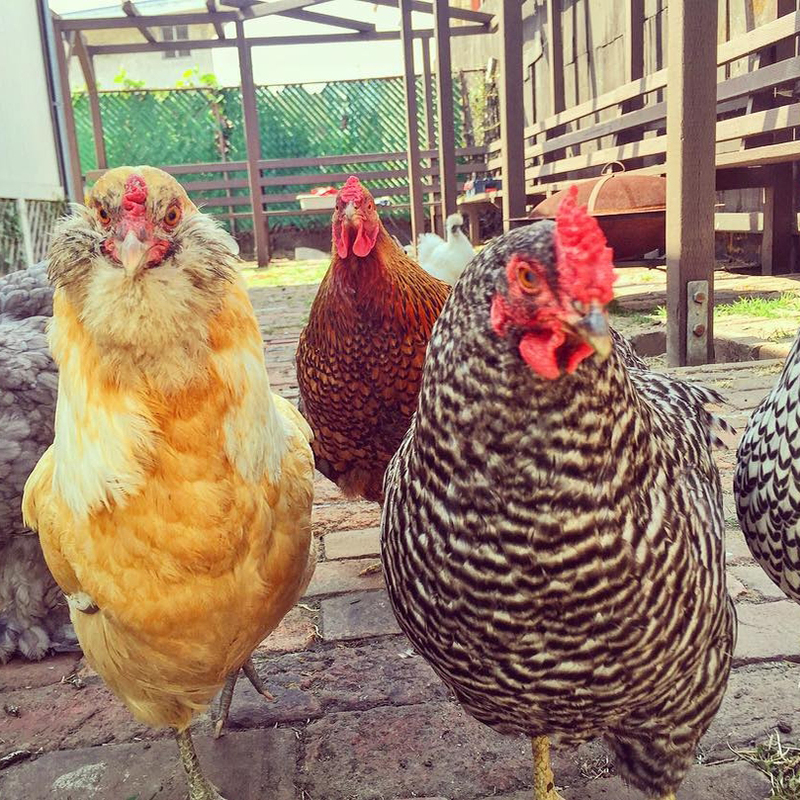 She lives in an urban backyard environment in Oakland, California with five other hens as part of the ‘Bean Team’. The other members of the 'Bean Team' include Lentil, Fava, Jellybean, Kopi (which means coffee in Indonesian), and Cannellini Molasses-face). 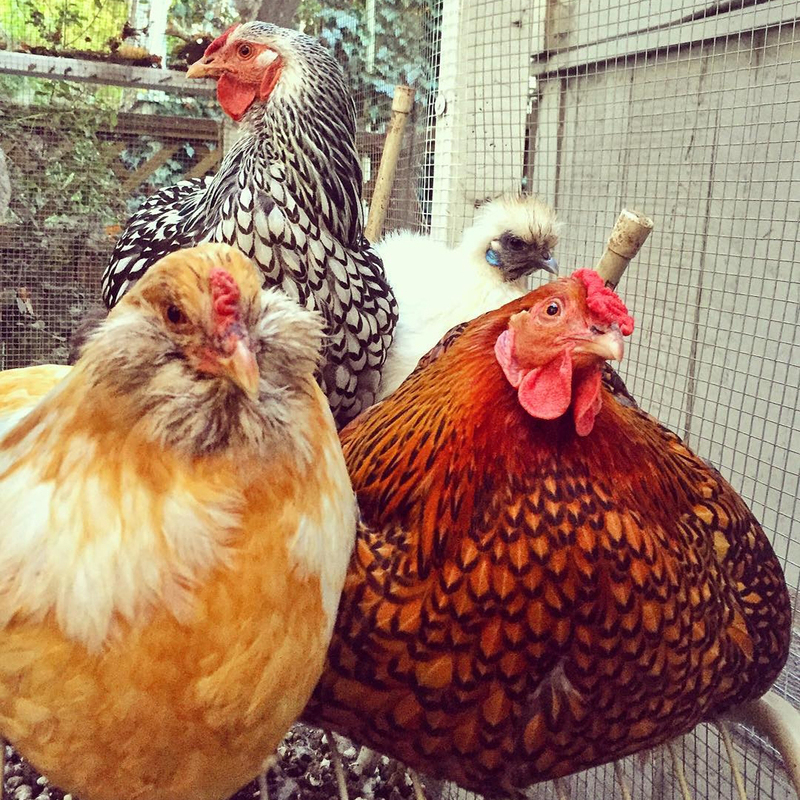 The flock of sweet hens are kept in a large predator-proofed enclosure outside, within a fenced in backyard. The enclosure contains a chicken coop for them to sleep in at night and to lay eggs in built in nestboxes during the day. 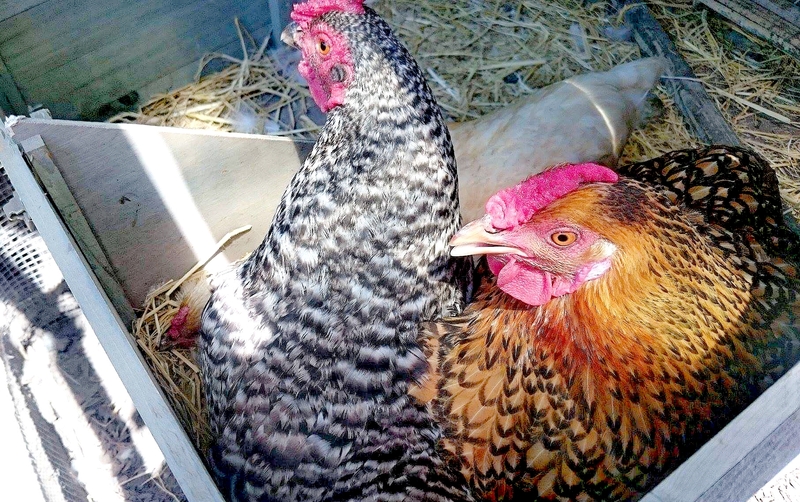 Whenever one of their owners, Alex Witte and Zac Diener are home, they let the girls explore the remainder of their fenced in backyard to scratch and forage in the garden. 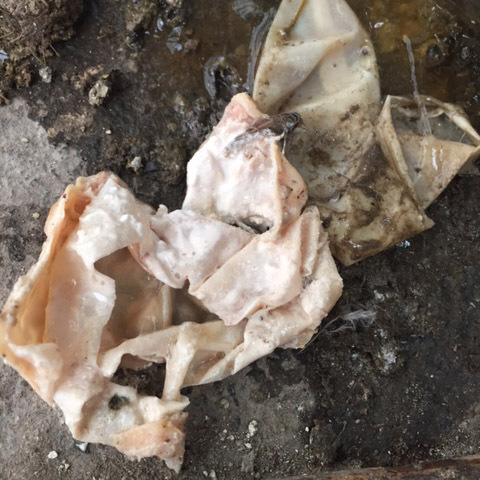 One morning, when Alex was in the coop feeding the girls their breakfast, she came across a yolk and white material from what would usually be inside an egg, on the ground without any egg shell material in sight (otherwise known as a shell-less egg). Alex started throwing out some freeze-dried mealworms for the birds in the garden. 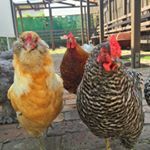 Most of the hens would intensely chase after the worms just as they normally would, however Adzuki ate one or two and then just stood in place, uninterested in going after any more worms. The rest of the birds were running around like crazy after the remainder of available worms. A few hours later, Alex looked in on the girls and noticed Adzuki sitting in the nestbox, panting really hard with her beak open. 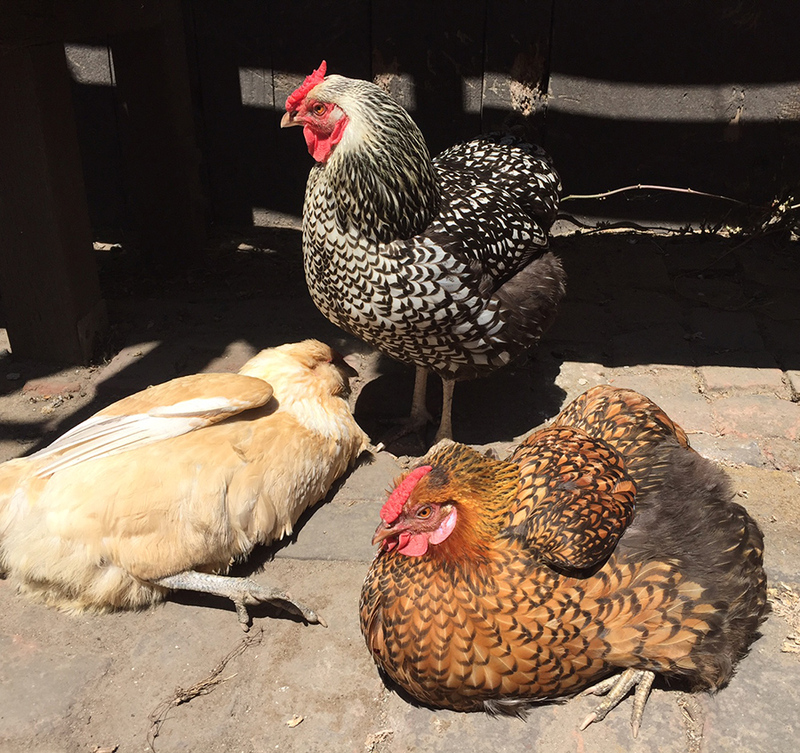 However, it wasn’t hot out and the other hens weren’t panting. Adzuki in the nestbox with Kopi and Cannellini, who are there giving her some moral support. Alex suspected that perhaps Adzuki was egg bound, and she and Zac brought her inside the house and gave her a warm bath to try to see whether that might help relax her into laying the egg. Several minutes went by and Adzuki started to look like she was falling asleep, and started acting very lethargic. Alex removed her from the bath and gently placed her inside a shallow cardboard box lined with a blanket, with easy access to a small dish of water and feed (which Adzuki never touched). While Alex was tending to Adzuki, Zac called up Montclair Veterinary Clinic and scheduled an emergency appointment for Adzuki to be examined by a veterinarian. After Zac described to the receptionist the signs Adzuki had presented with, the clinic agreed that she needed immediate medical attention and scheduled her in to see a doctor that same afternoon. Dr. Justin Cupka greeted Zac and Adzuki in one of the examination rooms at the veterinary hospital. He gave Adzuki a physical exam and palpated her abdomen to see if he could feel the presence of an egg. He didn’t feel anything there, however that didn’t mean there wasn’t an egg present---for soft-shelled and shell-less eggs often aren’t detectable through palpation. 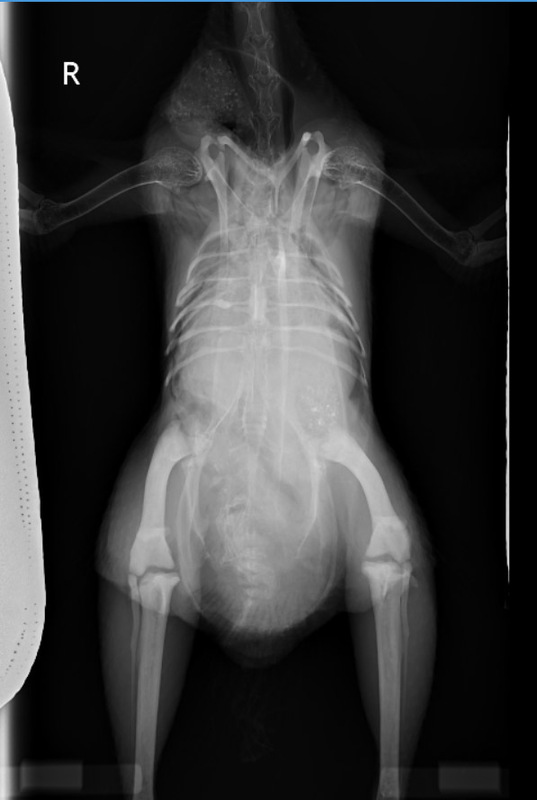 Dr. Cupka then recommended an ultrasound, for it can be useful for helping to identify the presence of many types of egg abnormalities that are not recognizable in radiographs, including thin-shelled, malformed, and shell-less eggs. Adzuki’s ultrasound didn’t reveal any significant findings. Since Adzuki had not been eating or drinking on her own, she had become dehydrated, so the doctor administered subcutaneous fluids and a Vitamin B12 injection (1000 mcg/mL). 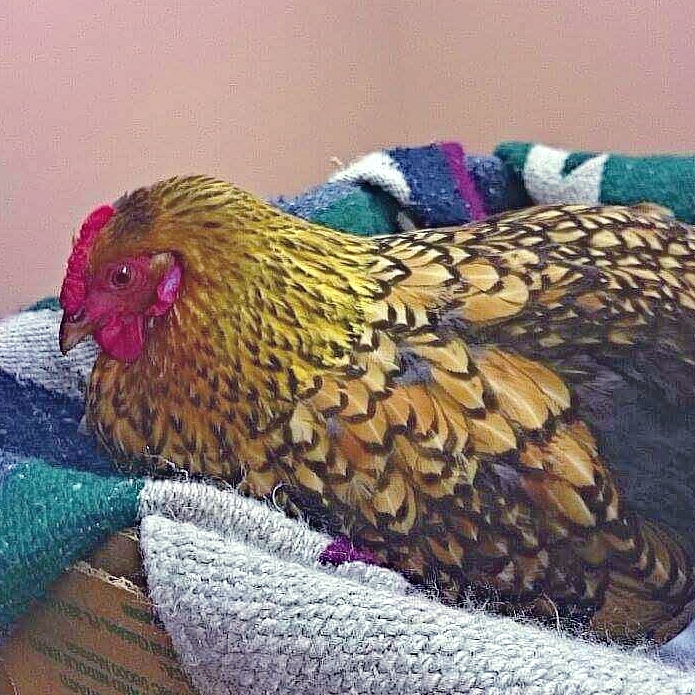 Based on her history, clinical signs, physical exam, and absence of relevant findings from the ultrasound, the doctor concluded Adzuki had egg yolk peritonitis. Due to her lack of appetite and reduced intake of water, he advised that her prognosis for recovery was not good. Dr. Cupka prescribed Enrofloxacin (Baytril), 20 mg/ml which is a type of antibiotic, to be administered to her orally by mouth twice a day, for four days. 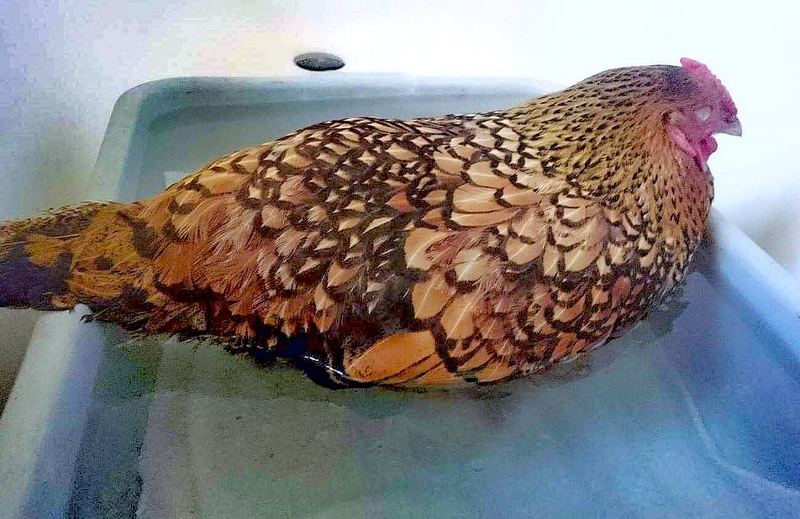 Dr. Cupka also brought up his concern about the abnormal eggs Adzuki laid---since egg yolk peritonitis is caused by the presence of rotting egg material inside the hen. He suggested that if Adzuki recovered, that Zac and Alex should probably consider spaying her----as a means of preventing future egg-related infections. While Adzuki was recovering and receiving her antibiotics, she was kept inside the house with Alex and Zac. 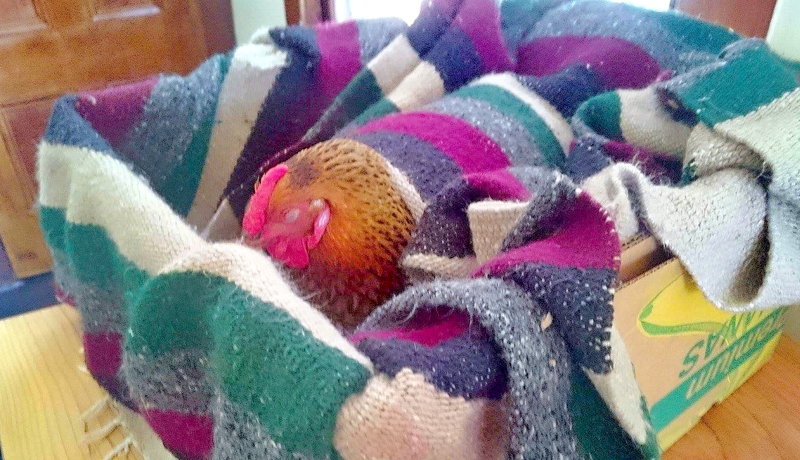 They put together a chicken ‘sickbay’ for her, using a 2’x4’ plywood box layered with blankets that was placed inside their office room, so they could keep a close eye on her. They provided a small bowl of fresh water and feed positioned so that Adzuki had easy access, to promote her eating and drinking. For some additional supportive care and enrichment, Adzuki was pampered with regular all-star spa sessions (warm baths and blow dries) and cuddles. Adzuki’s appetite slowly returned to normal and she started drinking again. 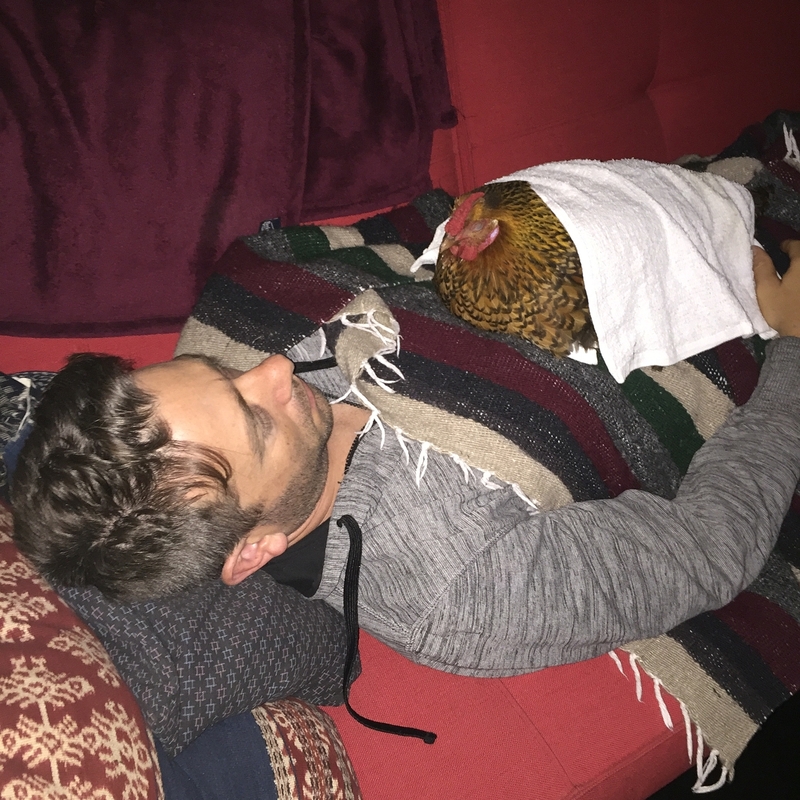 Once Adzuki finished her course of antibiotics, and Alex and Zac were convinced she was feeling better, they returned her to live back outside with her feathered friends. Separating herself from the other birds. This time however, Adzuki was still interested in food. Zac and Alex decided to take Adzuki to an Avian Specialist, and made an appointment for her to see Dr. Lynn Dustin, a board-certified avian specialist from Bay Area Bird Hospital in San Francisco. At Adzuki's appointment, the Dr. Dustin took radiographs of Adzuki's body and ran a CBC on her blood. 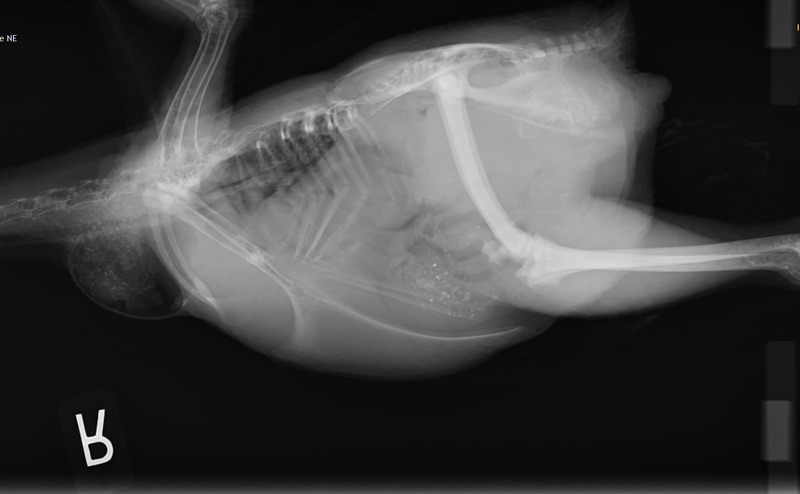 The xrays revealed two clues as to what was wrong with Adzuki---she had an eggshell stuck inside her oviduct, and an extremely enlarged ovary. Adzuki had an ovarian tumor. The tumor was so large in fact, that it was displacing her intestines and was the likely cause of why Adzuki was laying abnormal, shell-less eggs. The tumor in her ovary was causing her eggs to break while passing through the oviduct, resulting in Salpingitis (inflammation of the oviduct). Hormone implants – To stop Aduzki from laying anymore eggs, which would help minimize the risk of further egg-related infections. Oral administration of Metacam, a non-steroidal anti-inflammatory (NSAID) drug – Given via syringe twice a day. Alex and Zac took some time to think what to do moving forward. After a great deal of consideration, they decided that they couldn’t justify the expense associated with these treatments---not when Adzuki’s tumor was already in the later stages of progression. Also, they knew Azuki wouldn’t be too happy with the syringe feedings, and didn’t want her to have to go through that. Alex and Zac decided to go a more holistic, natural route to treat Adzuki’s cancer—by adding a specific mixture of herbs to her feed. This way, she could live out the remainder of her life happy and comfortable. After doing some research on different herbs that have shown to possess anti-tumor properties specifically against ovarian cancer, the couple put together a mash of flaxseed meal, turmeric powder, and ginger powder mixed with water. All the girls in their flock receive the mixture now. Although the mash is not exactly on the top of Adzuki’s list of favorite things to eat, she and the other girls do eat it. Alex and Zac are trying to make it more palatable by adding dehydrated mealworms and such. Once they find a mixture that the girls like a lot, Alex and Zac plan to make a larger batch and give it as a couple tablespoons a day, so that they don’t have to make it every day. 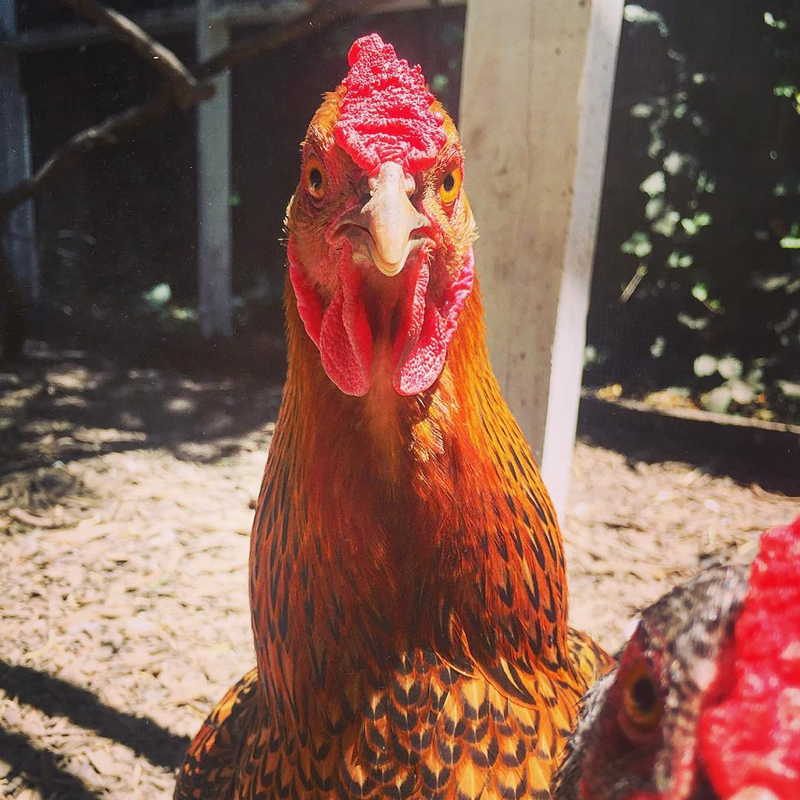 Some other options they are exploring are adding green tea to their waterers and a CBD oil mixture that Sky’s the Limit Sanctuary has been using with success for one of their hen’s, Oreo who has liver cancer. Since her vet appointment, Adzuki has been doing well---she looks great, is happy to be back and mingling with her girlfriends, and is eating and drinking normally. What matters most to Alex and Zac, is that Adzuki is able to live the remaining months of her life being happy. 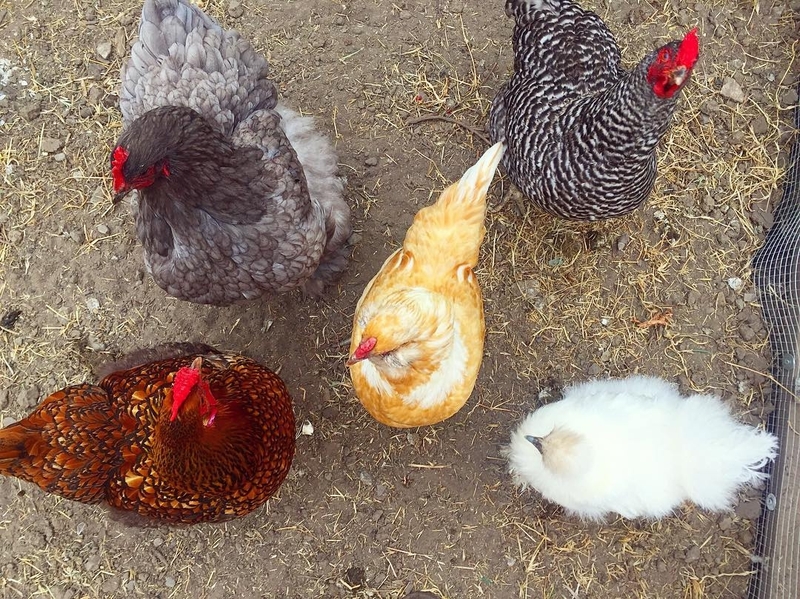 Follow Adzuki, as well as the other members of this adorable ‘Bean Team’---Lentil, Fava, Jellybean, Kopi, and Cannellini Molasses-face on Instagram @bean.team.chickens and keep up with all their fun adventures and adorable photos! Bay Area Bird Hospital has provided specialty services for avian and exotic patients since 1989. Their experienced staff and specialized equipment enable us to handle a wide range of medical and surgical conditions. Dr. Leila Marcucci and Dr. Lynn Dustin are the only board certified Avian Specialists (Diplomates of the American Board of Veterinary Practitioners) in all of San Francisco, San Mateo and Marin counties.